bananas, cut into chunks, and chocolate chips, to decorate. Cream butter and sugar until fluffy. Add egg and bananas. Mix baking soda with hot water and pour into the butter mixture. Fold in the flour and salt. Stir in chocolate chips. 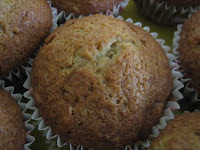 Spoon the batter into greased muffin cup/lined with papers muffin cups. 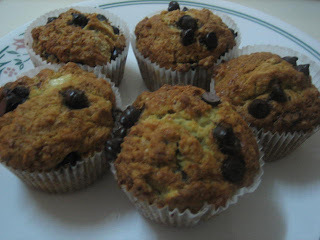 Top each muffin with 2 bananas chunks and sprinkle with chocolate chips (i did not put the chunks when i baked this muffins). Bake at 180C/360F for about 20 minutes. Note:- I only use pisang rastali for this recipe, but other bananas should be fine too. This picture was taken from the picture in the book. Dad and son preparing for tug of war, the last challenge for the telematches event. The trip home was almost the same except for the fierce rain when we just entered daerah Rompin after Bandar Muazzam Shah. The rain was very heavy it became scary as the trees were swaying violently and managed to avoid a fallen tree without the hubby losing control of the car. I was quite pissed with some drivers who did not on their vehicles lights in that pouring rain. On KL-Seremban highway, many times I got irritated with the drivers who would on their hazard lights at the slightest drizzle. But here they didn't even on their lights in the torrential rain....sheesshh......Anyway, we were safely home at about 8.00 pm on Sunda y. The trip was good but i missed my own old bed. I slept like a log last night. 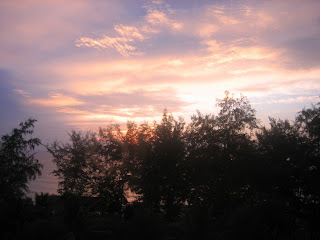 Lovely sunrise from our room. I love east coast beaches. So last month when dear hubby said there would be a trip to Awana, Kijal planned by his office, i was quite looking forward to go. We decided to drive there though the his office provided bus for this trip. As much as i like to travel but i just detest packing or unpacking, but it needed to be done anyway. And my heart was a bit heavy as we had to leave my oldest son behind as he had his monthly exams. We left for Kijal at about 11 am on Friday. We decided not to use the highway, we used the inner road. Some of our friends who travel frequently to the east coast told us that this route is shorter and more pleasing to the eyes. True enough for someone like me who is so used to KL-Seremban Highway, I was so taken with the beautiful kampung houses , the dragon fruits farms, hills and hills of palm trees and rubber trees and a sneak of tea plants under rows of coconut trees somewhere in Rompin. I only associate tea plantations with Cameron Highland. We had late lunch at R and R Bandar Muazzam Shah which cost us a bomb. Maybe i was expecting that things should be cheaper in small town but boy...was i wrong. But the ikan kembong goreng tepung was very yummy so do not really mind the price. Gambang - Cherating road was under major construction, so not much to see. Once, we entered Cherating areas, we could see so many sign boards of small and big resorts, keropok lekor stalls all the way to Kijal. We could smell the sea breeze and at times the wind was quite strong. The weather was pleasant throughout our journey and we reached the resorts just after 4.30. We checked in and the room was comfortably big enough for 4 of us with 2 double beds, nice bathroom and beautiful view of South China Sea and the big pool of the resorts. The kiddos were so excited to get into the pool and though i thought i needed a little shut eye after the long sit in the car, i went to the pool with them and got the towels and just sat and read the NST beside the pool. We had lovely BBQ dinner. Saturday morning after early breakfast, my husband had the team building activities and the children and i just lazing around at the pool. We had buffet lunch and the kids spend their time in the pool ...again. Sunday morning, the husband and the second son had early breakfast as they would be participating in telematches. I went down for breakfast just after 8.00 am with the younger boy. While walking to get a cup of coffee, i faced a very familiar face. I was so stunned i froze for awhile. I collected myself and managed a pitiful suprised smile to the Nik Aziz the MB of Kelantan. He was with a few gentlemen. When i sat at my table, i took a glance toward the group and was hoping to see Husam Musa or maybe the Kickdefella guy. But both were not there. Then i went to the beach to give my support to my boys, big and small. After the prize giving we went up to the room, had a short rest, packed to check out. Dad and son prepared to start the challenge. Angah after receiving prize, Angah quenching thirst, Angah and Baby counting sweets.. When i first got hooked with cooking /baking bugs, i started buying recipes books. Of course all other magazines in the market, but mostly local publications. After trying a few recipes from these buy, i seldom got satisfactory results. Not sure if i could not follow the recipes or the recipes published were not correct except one. I gave up on locally published material, i bought a few "mat sallehs' recipes books. And so far no recipes that i tried did not give me pleasant ending. But, imported books are very dear i feel guilty buying them ha ha ha......then my husband taught me how to browse the internet and oh boy....there are so many recipes i wish i could try them all...Jamie, Nigella and many others put their recipes online, and they are so well known people do not mind paying for their books. And so many food blogs i sometimes get so carried away hopping to one blog to another. 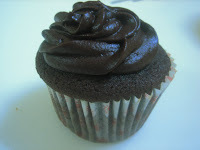 These cupcakes recipe is from one food blog i found a couple of months ago. I have made these a few times and these pictures were taken after i baked these beautiful and delicious cupcakes for my husband cousin's housewarming dinner party. Not quite sure why its call humming bird cupcakes but maybe its because the combination of the fruits pineapple and banana ....best part my mum in law neighbors quite often ask me to make these cupcakes whenever i bumped into them when i was at her house. I see my mum in law quite often as i get my coconut milk from her. My in laws are doing that business from the house. Not big but i think just enough for them to always have cash in hand and while away their time . Beat cheese, butter and vanilla until well blended and add the sugar until you reach the consistency you want. 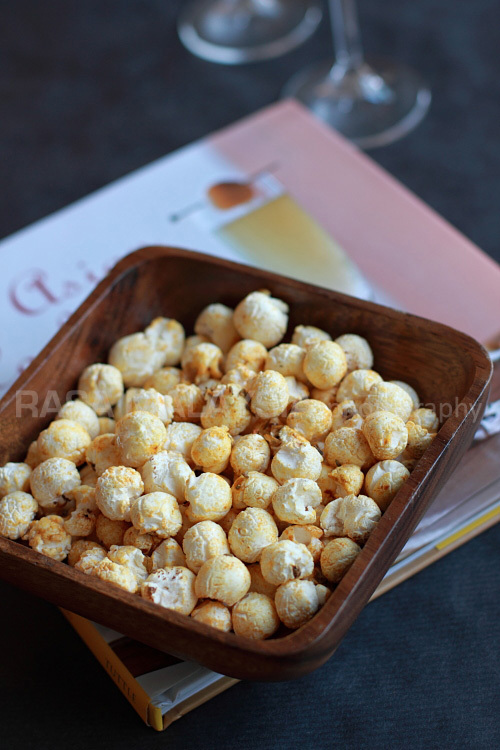 Do give this recipe a try and have a pleasant weekend. David Tutera's Southern Fried Chicken. Clean the chicken and dry with paper towel, rub the chicken with cayenne pepper, salt and black pepper, dredge the chicken with flour and fry in a very hot oil....10 mins on each side and the chickens are done. Cut in butter until crumbly and reserve 1 1/4 cup of the crumble. as for remaining mixture, add in baking powder, baking soda, salt, sourcream or the alternate, the egg and mix them well. Spread the batter evenly in the cake tin. Then, beat cream cheese, castor sugar and the egg together till incorporated. Cool in the pan for 15 min, the remove the side of the cake tin. Note: after 30 - 35 in the oven, cover the cake with grease proof paper to avoid the flakes frm burnt. My older 2 boys love bowling. The youngest one still say the ball is too heavy for him. So, whenever we go bowling, he just watch the rest of us throwing the bowling ball and praying miracle to happen that we would get a strike. The boy in action is my second son. My other half and i enjoy bowling too. In my next trip to get my baking supply suddenly i saw so many packets hanging neatly against the shop wall with the words "Serbuk Dadih Buah-buahan" staring at my face. I took one of the packet and looked for the ingredients and true enough the words agar-agar were listed. Haa...the prove i can show to my dear mum in law i said to myself...i bought one and showed it to her and she just nodded. I think some people do not read the ingredients when they bought this kind of thing. However, one think i notice, kids really like to eat these especially if its kept in the fridge for awhile. I made earlier with the recipe i got from the net and the second time with the mixture from the packet, i think the first time version was better. These were the dishes we had for dinner last night. Ray fish in hot sour gravy (asam pedas), crispy fried tempe and my version of fried chicken. I do marketing every other day and when i went to the market yesterday morning it took me awhile pondering in the car about what should i serve for dinner. Remembering the other day my big boy asking me why i had not make the asam pedas for sometimes i decided to cook just that. Then when i was in the market the girl selling the vegetables told me that she has plenty of tempe and i got some. While at the fish stall i was so taken with the freshness of the ray fish, i didn't realise i took 2 big cut of the fish. It was almost 2 kg ha ha ha..... I was lucked out on the ginger bud (bunga kantan) so i went to a supermarket near my in laws' place. Then i dropped by at their house and had nice morning teh 'o' and chatted awhile with my mum in law. I gave her half of the fish. Lunch fare usually very simple at home since only 3 of us would be eating my 2 younger boys and myself. Usually we have fried rice or burgers or hotdog or bread but i would be frowning if the kids ask for maggie mee, but sometimes i would give in. 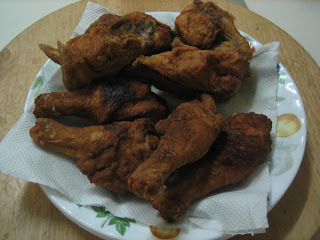 Just fried tempe, Ray fish in hot sour gravy( asam pedas) and my fried chicken. I went up to KL 2 week ago and bought blueberry. Not easy to find this in N9, so i just bought for my kiddos. I put it in the fridge and completely forgotten the existence ha ha ha. Lucky i realised i had blueberry in the fridge after 2 week, if not it would be wasted if it gotten spoilt. 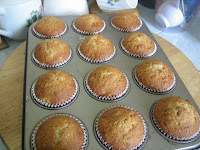 so i ended up baking the muffins for tea last week. Recipe adapted from Australian Women's Weekly cooksbooks titled " Muffins, Scones and Breads". Here are what i tossed into the big pot for this sauce. Heat the olive oil and throw in onion and garlic, dump in the burger meat and pour in the tomato sauce, tomato puree and the water. Put in celery, carrot and mushroom. Let it simmer for half an hour or more. Throw in oregano and dried basil, put salt and pepper to taste. If the sauce get too thick just add in some water. Meanwhile boiled the spaghetti as per instruction on the package. Then of course served hot...enjoy...my kids did and they also wallop the sauce with toasted bread. Measure out into cupcake pan lined with cupcake papers. A 2″ ice cream scoop works great for this. Bake for about 15-20 minutes until a toothpick comes out clean. Let cool slightly in the pan then transfer to a rack to cool completely before frosting. 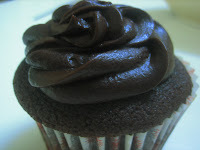 Piped the frosting onto the cupcakes with a large star tip. 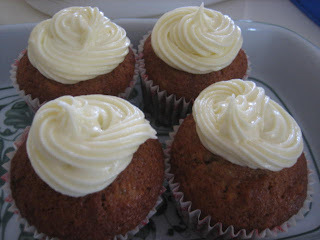 I made these for dessert yesterday with the help of my youngest boy. I knew he would be gleefully assisted me to make holes in the tart base with a fork. So after pressing the dough into the moulds, i had him making the holes...should see his ear to ear smile doing that...i copied this yummy desserts from Fantastic Cheesecake book by Alex Goh baking class book (picture below). Cream butter and sugar lightly. Add egg and cream till smooth. Add flour and mix until well blended. Press the dough into the tart moulds. Make holes into the base and bake at 180 degree for 15 - 20 mins or until tarts evenly brown. Cooled. Beat cheese and sugar until smooth. Put aside. Mix juice with custard and add to melted chocolate until well blended. Mix with cream cheese mixture until well incorporated. 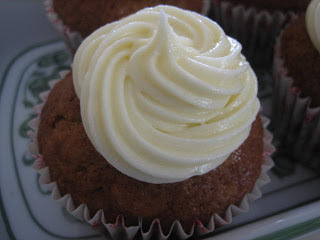 Fold in whipped topping cream until evenly blended. Pipe into the tart moulds.